Our task here is to calculate the capacitance of a capacitor once we know its ometry. Because we will consider a number of different geometries. it seems wise to develop a general plan to simplify the work. 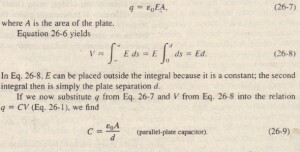 In brief our plan is as follows: (I) Assume a charge q on the plates; (2) calculate the electric field f between the plates in terms of this charge, using Gauss’ law; (3) knowing f. calculate the potential difference V between the plates from Eq. 25·18; (4) calculate C from Eq. 26·1. Before we start. 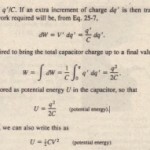 we can simplify the calculation of both the electric field and the potential difference by making certain. assumptions. We discuss each in turn. in which A is the area of that part of the Gaussian surface through which flux passes. For convenience, we shall always draw the Gaussian surface in such a way that it completely encloses the charge on the positive plate; see for an example. 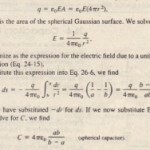 In the notation of Chapter 25 (Eq. 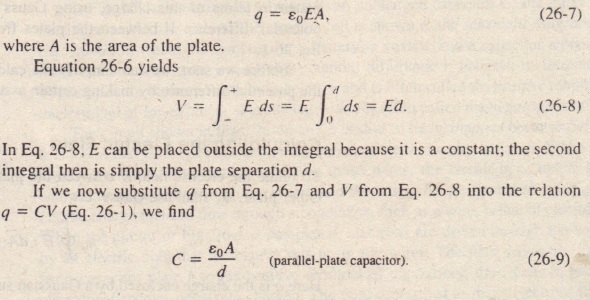 25·18), the potential difference between the plates of a capacitor is related to the field E by. the right side of Eq. 26-5 will then be positive. Letting V represent the difference Vf – Vi’ we can then recast Eq, 26-5 as.in which the – and + remind us that our path of integration starts on the negative plate and ends on the positive plate. We are now ready to apply Eqs. 26-4 and 26-6 to some particular cases. We assume, as Fig. 26-5 suggests, that the plates of our parallel-plate capacitor are so large and so close together the.twe can neglect the fringing of the electric field at the edges of the plates, taking E to be .constant throughout the region between the plates. . We draw a Gaussian surface that encloses just the charge q on the positive plate.as in 26-. From Eq. 26-4 we can then write. Thus, the capacitance does indeed depend only on geometrical factors-namely. the plate area A and the plate separation d. Note that C increases as we increase the plate area A or decrease the separation d.As an aside, we point out that Eq. 26-9 suggests one of our reasons for writing the electrostatic constant in Coulomb’s law in the form 1/41TEo. If we had not done so. Eq. 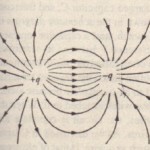 26-9-which is used more often in engineering practice than Coulomb’s law-would have been less simple in form. We note further that Eq. 26-9 permits us to express the permittivity constant EO in a unit more appropriate for use in problems involving capacitors: namely, EO = 8.85 X IO-I~ Film = 8.85 pF/m. (26-10) We have previously expressed this constant as EO = 8.85 X 10-12 c2/N . m2.